Preheat oven to 400 degrees F. Line a baking sheet with parchment paper. In a large bowl, combine the chicken, red bell, coumin, cream cheese, and shredded cheese. Re-roll dough as needed. Repeat procedure with remaining pie crusts. Arrange the rounds on a clean, flat surface. Place a small spoonful of chicken mixture in the center of the round. Fold dough over filling, pressing edges with a fork to seal. Repeat until finished. 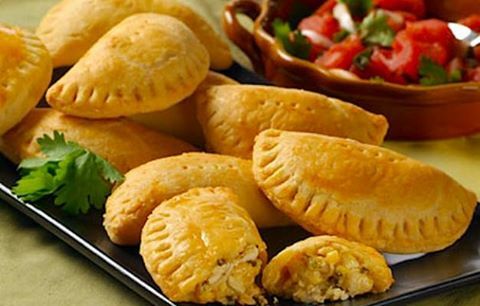 Arrange empanadas on a prepared baking sheet. Brush with an egg wash. Bake 12-15 minutes until lightly browned. Ovens vary so keep watch them closely. Inspired by a recipe from Paula Deen.